At 00:20h a static tripod mounted Panasonic Lumix DMC-FZ72 bridge camera at 60x optical zoom, was set to ISO 100 and 1/250s exposure. Images of the 74%, waning, gibbous Moon, were captured in bursts of three. 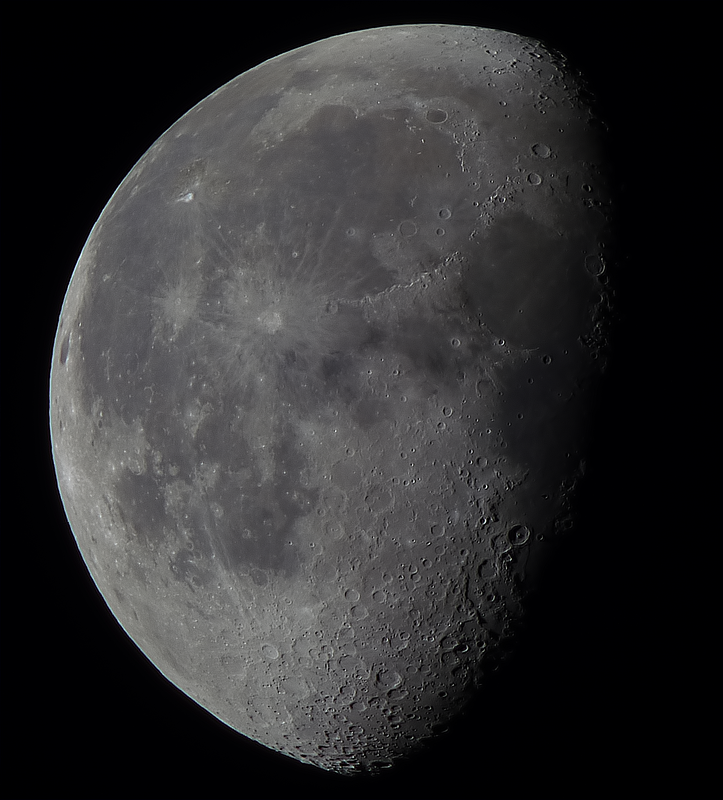 104 images were precisely cropped in Nicola Mackin's AstroCrop for Linux, under Mint Linux, the cropped and registered images were stacked and wavelet processed in Registax 5.1 running in Wine and the final image post processed in the Gimp 2.9. The process was repeated at 07:18h and 75 Images of the 71%, waning, gibbous Moon, were precisely cropped in Nicola Mackin's AstroCrop for Linux, stacked and wavelet processed in Registax 5.1 and the final image was post processed in the Gimp 2.9. Click on the image and click again, to get a full size view. 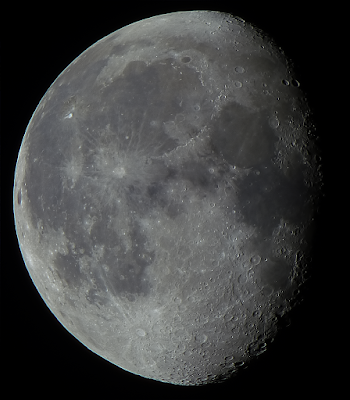 The different orientations of the Moon are a result of using an alt-azimuth system and the degree of image rotation after 7 hours is shown. On Saturday Nov 19th we have an all day event at the National Botanic Garden of Wales, Plants in Space, from around 12noon to 4pm. This is followed by our Star Party from 6pm to 9pm. The Cafe Med in the Great Glasshouse will be open all day until close and through the interval between the events - 4 - 6pm. In addition, we are setting up in the Great Glasshouse from around 2pm and, weather permitting, hoping to do some Solar observing. A static tripod mounted Panasonic Lumix DMC-FZ72 bridge camera at 60x optical zoom, was set to ISO 100 and 1/350s exposure. Images of the 81%, waning, gibbous Moon, were captured in bursts of three. 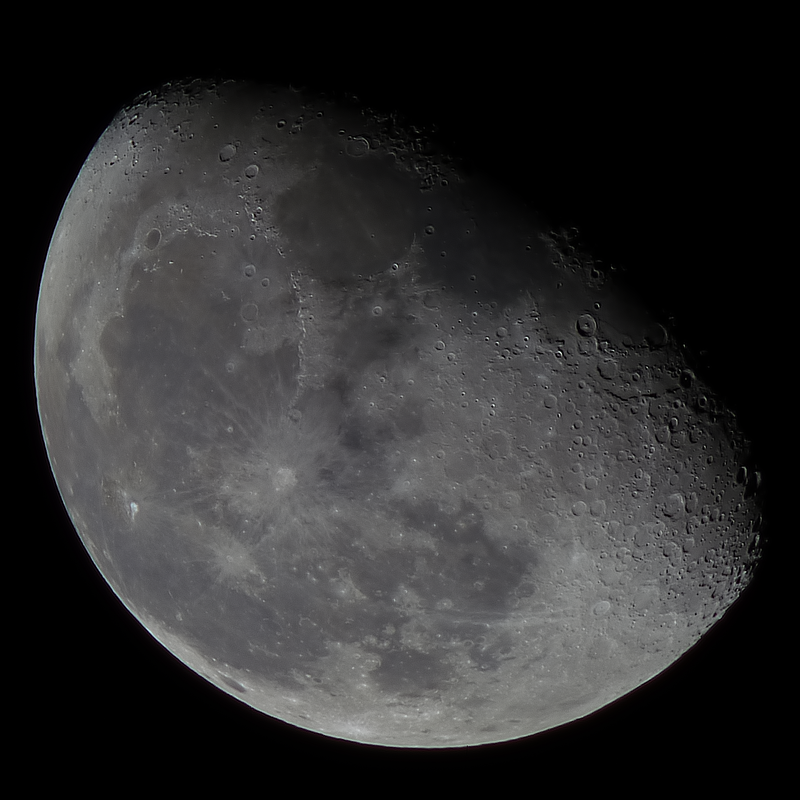 103 images were precisely cropped in Nicola Mackin's AstroCrop for Linux, under Mint Linux, the cropped and registered images were stacked and wavelet processed in Registax 5.1 running in Wine and the final image post processed in the Gimp 2.9.